Remember when I talked about the two mischievous dogs who stole the guests' underwear... Well, a hero arose from all the mayhem. Two white ogre puppies stole the underwear. Shih Tzu Princess Chooey to the rescue!!! Not only is the Shih Tzu princess loved by her people (peepz) but she is also relied upon for her courage and bravery in the face of underwear chaos. Translation: She literally took the underwear from the two cream-colored hyperactive dogs and returned it to the owner. And yes, I am one proud mama. One of the guest who had just hung her underwear on the clothesline had to chase the sneaky dog bandits (err... puppy ogres) for hours. Fortunately, Princess Chooey was on the watch. 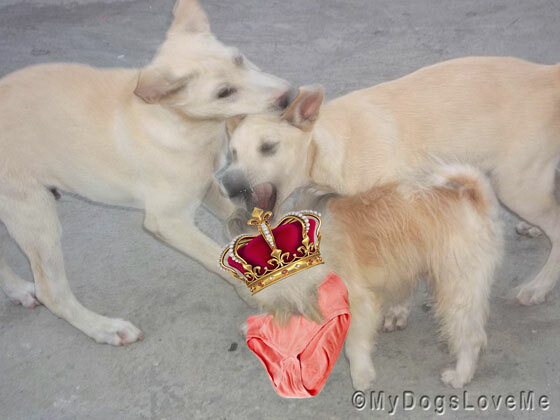 She took the underwear from their canine clutches and strutted down the castle grounds carrying the prized underwear towards her people (our female human guest). "Here's your treasure. They won't bother you again." Translation: She gave the underwear back to the owner. LITERALLY! By the way, I almost forgot to post about the giveaway Ms. Peggy Frezon sent me through my sister in the US. Thanks, Peggy. My sister told me that after you emailed me about the book, she got it in the mail the day after. 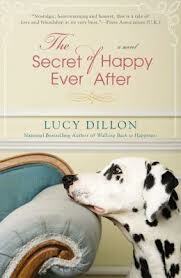 I read some parts of The Secret of Happy Ever After and am awed by how well written it is. Can't wait to finish it. 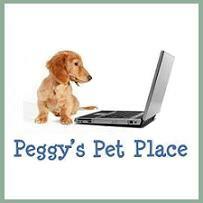 Just click on the button to drop by Peggy's blog. And that's the end of my Mischief Monday post. Wow that was some mischief and mayhem narrowly avoided by brave Chooey. Have a marvellous Monday. Chooey deserves a doggie treat for her brave rescue. Chooey deserves a treat for that. . . a treat wrapped in BACON and dipped in PEANUT BUTTER! Well somebody needed to return them - good job! Hip hip AAArrroooooooo, Chooey, the Warrior Princess!!!!! I have a feeling someone was having a very good time!